- “Set node as output” is now part of the Undo/Redo stack. - 3D Viewport improvement: Mesh can now be moved with Shift + Left Click. - Added configuration file to let users customize app parameters. - Added compute & viewport shaders hot load, you can now edit and test shaders without restarting the app, but be sure to enable it in the configuration. - Implemented Chopped compute shader execution to seamlessly support big resolutions (2k & 4k) without blocking the app or crashing for GPU usage. - Added nodes Processing bar. - Ambient occlusion output texture is now used multiplying the final color. 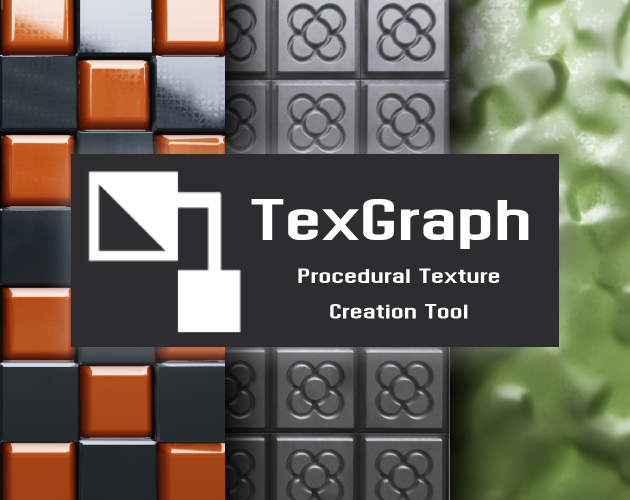 - Height output texture is now used for relief mapping. - Fixed undesired behaviour while undoing changes in a loaded graph file. - Fixed wrong implementation in Blur node for different texture resolutions. - Fixed important memory leak in render pipeline. - Fixed Save flow bug. - Fixed crash after deleting a node with connections and closing the graph. - Fixed an issue with mesh Y positions and directions, still under review. - Fixed nodes display name. - Fixed minor memory leak in mesh loading. - Improved memory profiler to track memory leaks and optimizable allocations, both for CPU and GPU. - Refactor of smart pointers implementation. - Improvements and bug fixing in messaging system. - GPU Commands instancing moved to Raw Pools. - Unique Ids data instancing moved to a Object Pool.